Several months ago back, I was watching Tea Time and they mentioned this book. I attempted to get it when I was at BEA 2013 and meet the fabulous Erin Bowman herself, but by the time I got out of one line, there wasn't time to get into hers. Once BEA was over, I immediately made a trip down to Jackson McNally Books in NYC where I picked up this book. But it has been in my TBR pile for several weeks (not as long as some, though) while I read and reviewed other books. This not the first time I've brought up Taken on this blog, either. 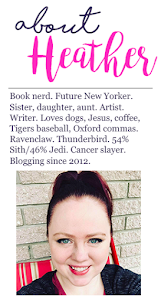 In my first Waiting on Wednesday post, I mentioned it and the trilogy's second book, Frozen, which was shown during the Epic Reads/Tea Time ARC Party. Finally, this past week I got to dive into Taken and I knew I was right about how amazing it would be. 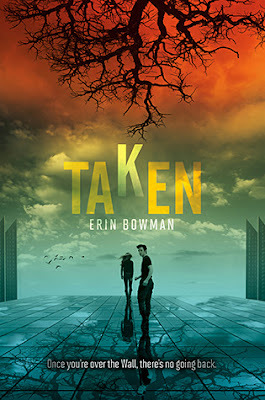 Bowman does an awesome job of world-building and setting the stage for Taken and the two novels that will follow it in the trilogy. In the beginning of the novel, we are introduced to Gray and Blaine Weathersby, brothers living in the town of Claysoot, a community with a mysterious past. Claysoot finds itself enclosed by a wall. On the other side? No one knows. No one has lived to tell the tale. Climbers come back to Claysoot posthumously, their bodies charred to a crisp. More mysteriously, every young man in Claysoot is taken from the community on his eighteenth birthday by a process they call "The Heist." Every young man without exception has been Heisted at the age of eighteen. The community's founders noticed the pattern after a few years of boys disappearing. Even more mysteriously, none of the town's founders seem to remember how they got to Claysoot. They woke up as children, remembering only their siblings, many years prior to the beginning of this book. It's the accepted standard of living in Claysoot. For this reason, boys begin something called "slatings" when they reach maturity at the age of 15. The town council assigns boys to girls in town on the premise that these girls will then sleep with them. This is the means by which they procreate. Despite it being the accepted standard, it's by no means easy on the citizens of Claysoot. When we enter Claysoot, it's the eve of Blaine Weathersby's Heist and Gray, his younger brother is lamenting and dreading the evening. He's also living in fear -- his Heist will take place exactly one year from his brother's. Once Blaine is Heisted, Gray finds a letter from his mother, one whose second page, ending, and possibly the solution to the problem of the Heists, is missing. With Emma, a girl Gray has been slated to whom he has always secretly loved, he begins to uncover the truth of his birth, the system of records in Claysoot, and believes he has found a loophole in the Heist, goes toe to toe with the wall, and survives the jump into the unknown. Over the course of the novel, Emma and Gray's trust in people and in each other wavers and sometimes even shatters. The path they take is fascinating and riveting. I was clutching the book for dear life for the entire 36 hours it took me to finish it. Now, I've read other reviews of this book. To me, this is a solid 4.5 hearts novel. Here's why: The pace was awesome, the world-building was superb, the plot was mostly fresh (which is difficult to find these days in the dystopian genre -- not every book can be like the Hunger Games. (In fact, those of us who love it loyally would prefer that not everything be just like it. Respect its originality, future writers! But I digress ...) To me, Bowman navigates the dystopian landscape well with her own spin on it. I felt like the novel made a bunch of unexpected, hairpin turns, which I crave. Did a few things remind me of other books? Sure. But there were so many other awesome things going on that it really wasn't that big of a deal to me. I thoroughly enjoyed the book and on the whole, it was distinctly its own entity. Taken was so wonderfully paced and riveting, I was clutching the book for dear life for the entire 36 hours that it took me to devour it. 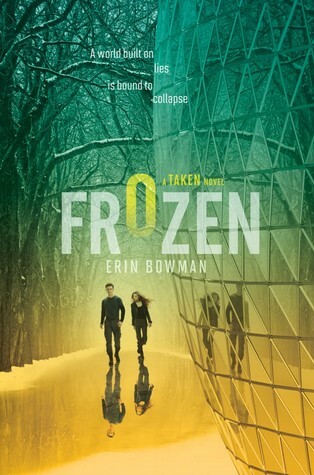 Bowman's second book in the trilogy, Frozen, will be released by HarperTeen on April 14, 2014 -- which is way, way too far away.